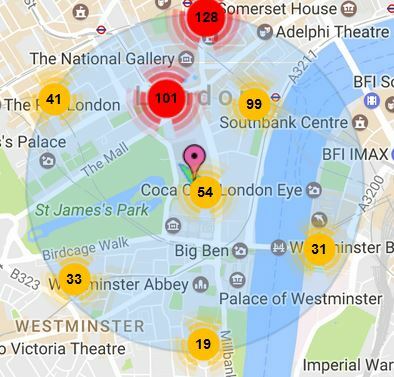 Buy your own complete up to date database of 1.6 million postcodes (England, Wales and Northern Ireland - not Scotland) matched to crime within different radiuses so you can instantly make comparisons. All postcodes with crime totals, crime rates and percentile ranking (0 is lowest, 100 is highest) by all crime and 16 different crime categories. View sample data below. 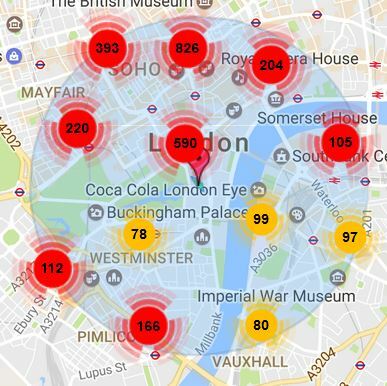 UKCrimestats.com is a proven, public-facing, trusted source used by academics, the media, insurance companies and underwriters in the City of London. For any questions or queries, contact us on crime@economicpolicycentre.com or Dan Lewis direct on +44(0)7900 245 306. N.B. - these are very large files, running to hundreds of megabytes that can't be emailed - after purchasing the data you will be able to immediately download them from your browser. 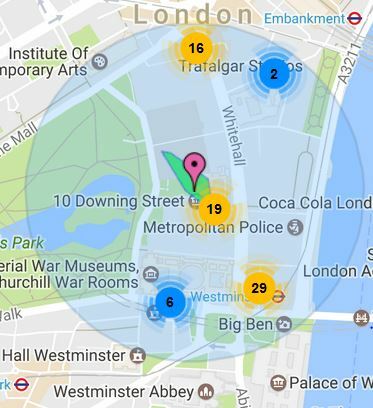 Below are crime maps of what a 1, 0.5 and 0.25 mile radius looks like around the postcode for 10 Downing Street in London, SW1A 2AA. Secure payments via WorldPay. Immediate download of 1 mile radius zipped csv file after online payment of �299.00. Secure payments via WorldPay. Immediate download of 0.5 mile radius zipped csv file after online payment of �299. Secure payments via WorldPay. Immediate download of 0.25 mile radius zipped csv file after online payment of �299.00. Recommended deal - save over 40% - �499.00 including VAT. These files updated once a month with the latest postcodes and crime over the last 12 months. Secure payments via WorldPay. Immediate download of zip file containing 3 files of 0.25, 0.5 and 1 mile radius zipped csv files after online payment of �499.00. UKCrimeStats.com was developed by the Economic Policy Centre Limited, Company Number 06985308, Unit 3 Cedar Court, 1 Royal Oak Yard, London SE1 3GA.